This year, students in the College of Arts and Sciences (CAS) have been able to get their hands dirty while putting down roots in the community – literally! The UTC Teaching & Learning Garden began this past spring, taking students out to learn about raising food in an urban environment. In total this year, the Garden was able to raise 2100 pounds of produce that was donated to the Chattanooga Community Kitchen. “And that’s pesticide free during an extremely difficult summer without rain. The students are learning more than they could have imagined. More than any of us could’ve imagined,” said Dr. Joe Wilferth, UC Foundation Professor and Associate Dean of the College of Arts and Sciences. The last harvest of the year, approximately 400 pounds of produce, was delivered to the Community Kitchen in time for Thanksgiving. “They had quite a Thanksgiving feast!” Wilferth said. Dr. Jose Barbosa, Associate Professor of Biology, Geology, and Environmental Science in the College of Arts and Sciences, is the primary faculty sponsor for the project, providing oversight and planning of the space. 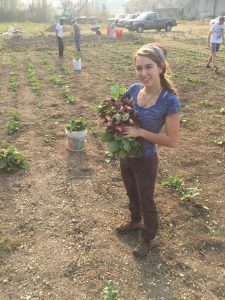 Most of the students who worked in the garden were earning class credit in Barbosa’s Urban Gardening classes. However, students not in Barbosa’s class also volunteered. “The garden is open for academic use to faculty and students all across CAS. In the future, faculty are invited to approach Dr. Barbosa or me if they wish to integrate the garden into their coursework,” said Wilferth. Wilferth looks forward to the opportunities for interdisciplinary and multidisciplinary work both within CAS and across the campus that the Teaching & Learning Garden provides. Approximately 125 students in Art, Biology, English, Environmental Science, Political Science, and Sociology all participated in the project since spring. “The garden may be used by specific courses across the CAS as it exemplifies experiential and hands-on learning. It could be expanded in the future to include courses and experiential learning opportunities in other colleges on our campus—e.g., courses in other colleges that focus on food production, nutrition, health and wellness, environmental literature, as well as the sociopolitical and socioeconomic factors involved in food production and food quality,” Wilferth said. The Garden is located behind the outfield wall of Engel Stadium, just around the corner from the Value Lot. This past March, the folks in Facilities donated their time and resources to clearing the land, which wasn’t previously in use, for the Garden. “This is an ideal space because of its proximity to campus. The shuttle service can take students to and from the garden. Class meetings wherein students visit/work in the garden will not require additional time, nor will the students’ academic schedules be interrupted,” Wilferth said. 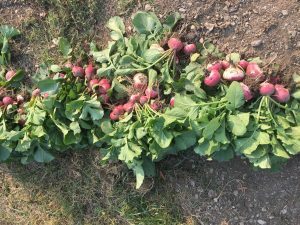 This year, all of the produce to come out of the Garden went to the Chattanooga Community Kitchen, but in future years some of the food may also end up in students’ stomachs. “In the future, we are considering ways to have something like a farmers market on campus where the proceeds might go to support student travel and undergraduate and graduate student research,” explained Wilferth. 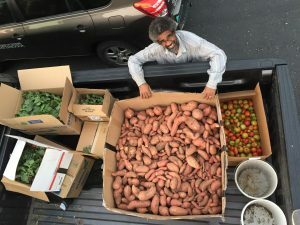 The Chattanooga Community Kitchen would still receive at least a third of the harvest. The Environmental Task Force, which oversees the “Green Fee” funds, supported half of the garden’s costs this year. Does anyone have research on plants and music? Contact me at Suprschool@aol.com.